“Long May You Run,” was written well before Neil Young started his alternative fuel project dubbed “LincVolt,” but it’s an apt descriptor nonetheless for the role POET’s cellulosic ethanol has played in solving range issues for the eco-friendly car. Neil Young, musician and champion of innovation, has converted a 1959 Lincoln Continental into a clean car that uses an electric and ethanol-based propulsion system. The crew is planning a cross-country tour and film to “inspire a generation,” according the project’s mission. That’s where POET comes in. 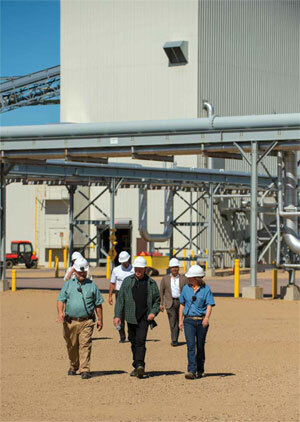 Cellulosic ethanol from the POET Research Center in Scotland, S.D. will be providing that alternative energy source. Young said the project is a way to reconcile two of his passions in life. So he looked into his options. Young and his crew update the process regularly on The LincVolt Gazette, his blog about the project. Young, whose music spans decades and genres, is an advocate of rural America. In the 80s, when farmers suffered from drought, high interest rates on loans and failing crops, Young teamed with other musicians to create Farm Aid, a concert that brought in nearly 10 million dollars for farm relief in its first year alone. Knowing that American farmers didn’t want a government handout or pity, the musicians behind Farm Aid wanted to raise awareness of the situation in the Midwest and find a solution to the problems. More than 25 years later, Young is again working with like-minded organizations to solve a problem: fossil fuel and its detrimental effects. Johnathan Goodwin of H-Line Conversions in Wichita, Kansas is a collaborator on the project. 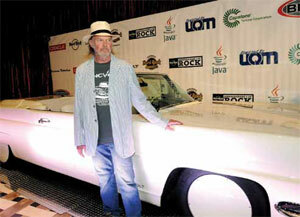 Neil Young poses with his LincVolt at the Hard Rock Hotel & Casino. He and Goodwin worked on the car together, dreaming of 100+ miles of fuel efficiency. Initially they were running water and ethanol through a rotary motor but couldn’t get the propulsion they needed for the 19-foot, 5,000 pound vehicle. Then one day Goodwin came up with another idea. With that, work began in earnest. Young and his crew filmed the process for a documentary that will bring viewers behind the scenes and to the forefront of his dream. They plan a cross-country road trip to Washington, D.C. to discuss with legislators energy and job issues that challenge America. And then Young patented Goodwin’s design for eventual commercialization. This kind of ambition is what Young is known for, and his sense of pride in American work and creativity underlies this project. Bushong sees this work ethic and ingenuity as something that also drives today’s ethanol producers and researchers. One of the goals behind this project and the work at POET is a solution to the many problems around oil use. As it is now, the collaborators are headed in the right direction.